Bonjinsha Bookstore(kojimachi-ten) is specialty bookstore about Japanese language education. we always stock lots of textbooks,reference books and aids. Store has the tables and chairs for who want to consider and read books before buying. we hope to be best store for you all with giving information,help for serching books. we’ll be very much looking forward to your visiting. 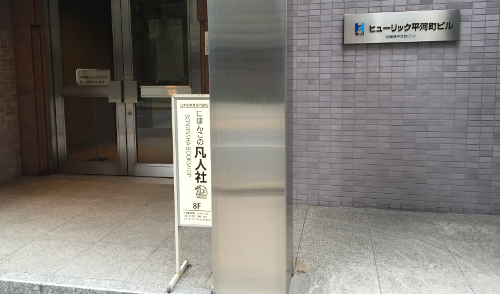 we moved to 8th from 1st floor on Nov. 2011.
the entrance of “Hulic Hirakawacho Building”. you will see white sign here,then please go inside and use elevator to 8th floor. here are links for downloading PDF maps. from Hanzomon line and Yurakucho line. 3min. walk from exit 1 of Hanzomon Sta. subway Hanzomon line. 3min. walk from exit 1 of Kojimachi Sta. subway Yurakucho line. 13min. walk from Kojimachi-exit of Yotsuya Sta. JR line. or you can use Toei-Bus “via Harumi-Futo”. 3min. walk from “Kojimachi 2 chome” stop.